There has been a lot going on in my life recently–including leaving my job, an outdoor adventure through the Balkans, moving to the Pacific Northwest, and some great hikes around the Cascades and Olympics…However, before getting to any of that, I’ll throw out a quick post on an amazing experience in Slovenia! 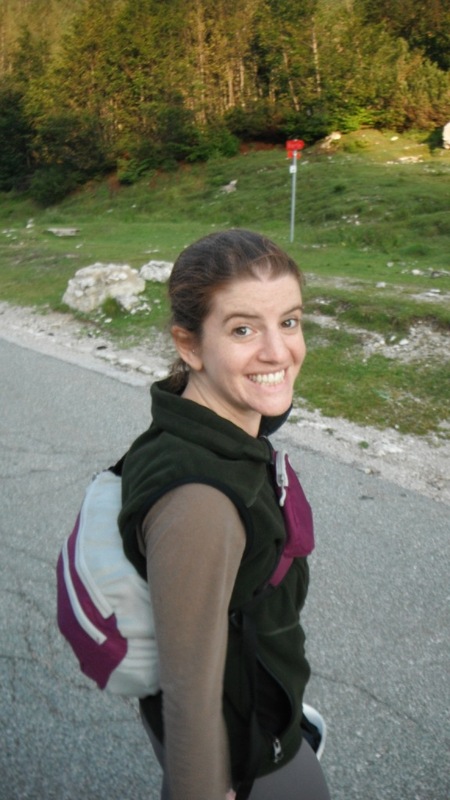 In early July, Hana, Jamie (our friend), and I found ourselves in Slovenia. Slovenia is the undiscovered jewel of Europe–a perfect combination of beautiful mountains, clear streams, jagged peaks, friendly people, and cheap beer. We were camping on the western edge of the Triglav National Park, in the Soca Valley, named after the turquoise river which cut through the white limestone f the valley floor. This was true fairy-tale country–dark forests rising up the mountains, twinkling villages tucked into the foothills, afternoon thunderheads, wildflowers, the list goes on. We spent an amazing three days in this mountain paradise, chock full of outdoor fun, from canyoneering to hill running to our final morning when we conquered the Mala Mojstrovka peak that towered over the Vrsic Pass. 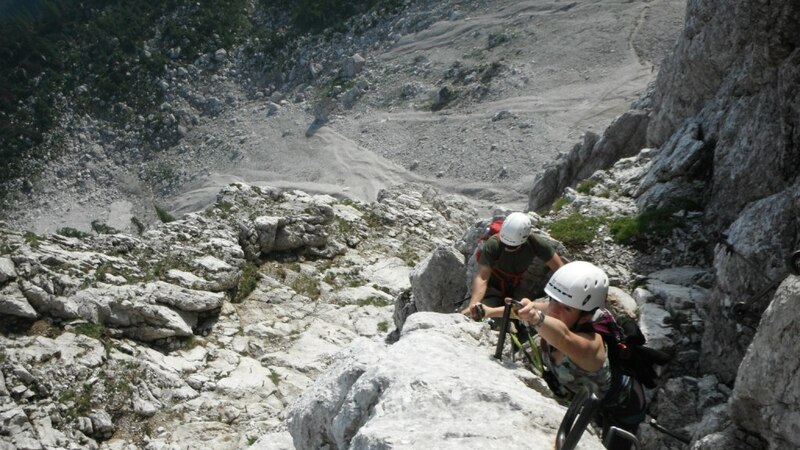 We would climb this mountain by using a via ferrata system. Via ferratas are essentially iron cables, rungs, and pegs hammered into the side of the mountain to allow easy access for the more-adventurous hiker or less-adventurous climber looking to quickly gain elevation. 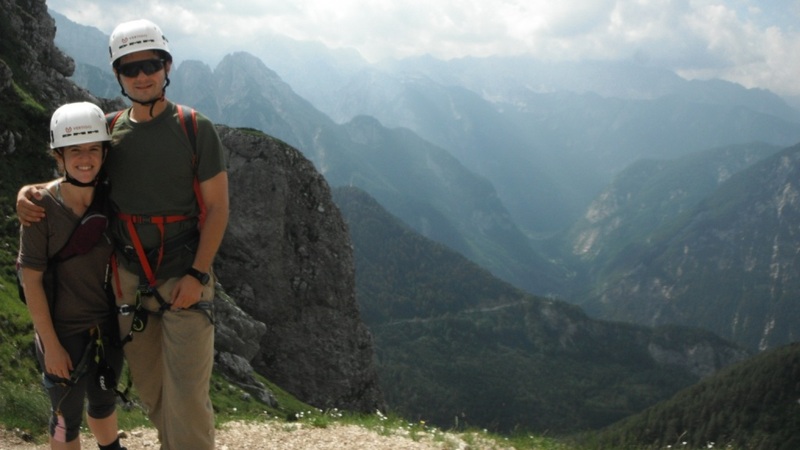 In the Dolomites and Julian Alps, some via ferratas were installed to access and resupply overwatch posts for World War I. The system is relatively simple–two lanyards with carabiners extend from a climbing harness, allowing the climber to stay clipped into the iron cable when passing bolts and rungs. The lanyards are dynamic to avoid harsh catches and undue tension if one falls. While not quite climbing, it isn’t quite hiking either, and offers up a truly enjoyable experience for an amateur mountaineer–ground is swiftly covered, and the positions and exposure similar to that of actual climbing. All in all, a perfect fit for an “easy” summer day. thundershowers. Sadly, Jamie had problems with her legs due to marathon training and wouldn’t be joining us–but she did get to run away from a cow while exploring the pass! Hana, myself, and Robbie–our guide–got into our harness at the base f the via ferrata and began scaling the mountain. What a day to climb a mountain! The sky was clear and crisp in the early morning air, and we developed a quick pace that ate up elevation. It was great to see Hana having such a good time, and our guide borrowed my camera to take action photos. 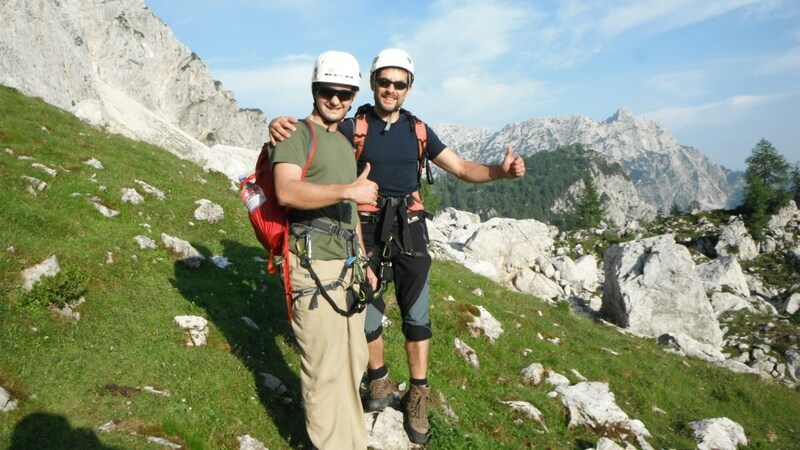 We cruised up to a false summit where the via ferrata ended. After that, it was all quads up to the real summit, which we shared with two other folks and a small herd of sheep! Ominous clouds were forming above the deep trench of the Trenta Valley, so we scree-slid our way off the peak. It took us probably less than an hour to reach the parking lot, where we regrouped with Jamie, and continued over the pass to a mountain hut for lunch and weird grapefruit beer. Right as we finished lunch, the clouds opened up–serendipitous? If you haven’t been to Slovenia, it’s time to book plane tickets. 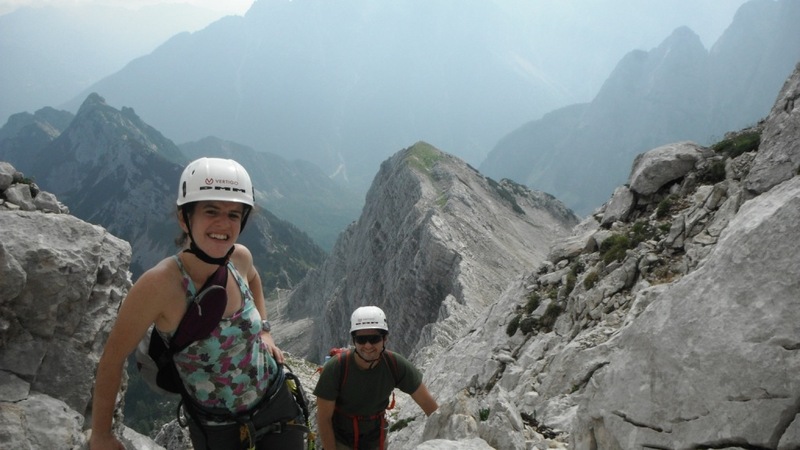 Visit Triglav, go canyoning, climb a via ferrata, just enjoy this gem of Europe–you’ll thank me.